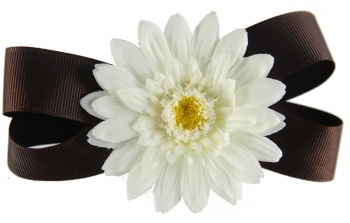 This lovely white daisy is attached with an alligator clip to this chocolate brown base bow. This is a great combination bow when worn together as shown, but since they each have their own clip they can also be worn individually. The brown is a chocolate brown 7/8" grosgrain ribbon and the daisy has a bright yellow center.